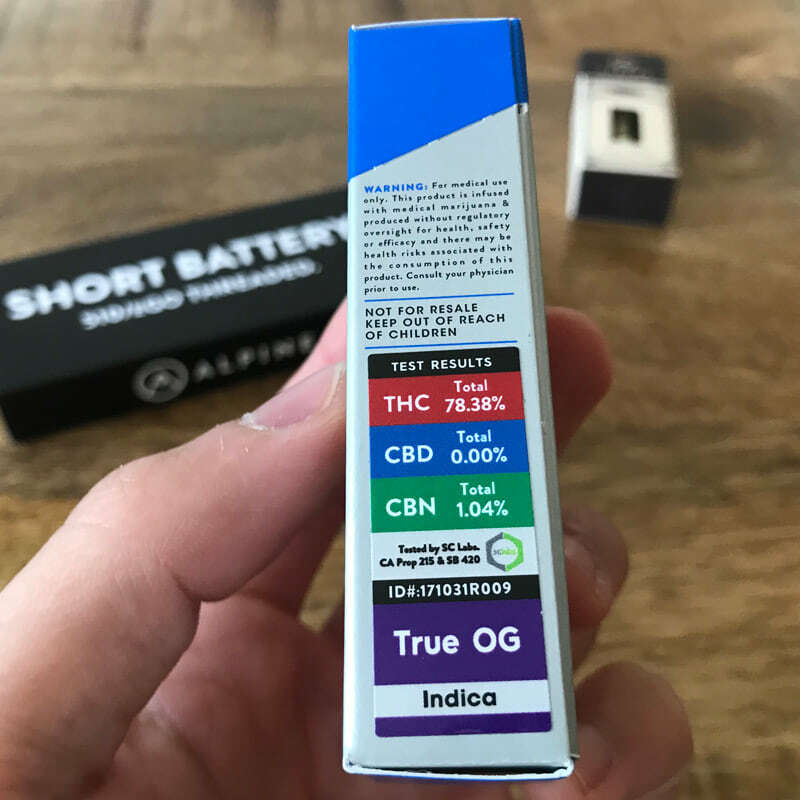 We had the opportunity to review Alpine Vapor’s latest line of cannabis oil vape cartridges. 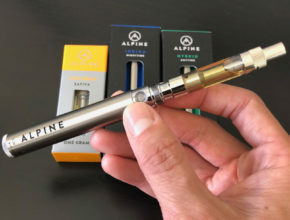 Alpine Vapor offers both Live Resin and high CBD oil which is available in half or full gram vape cartridges. 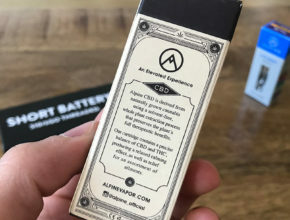 Alpine also offers a line of disposable vape pens, cannabis oil syringe refills and vape batteries. 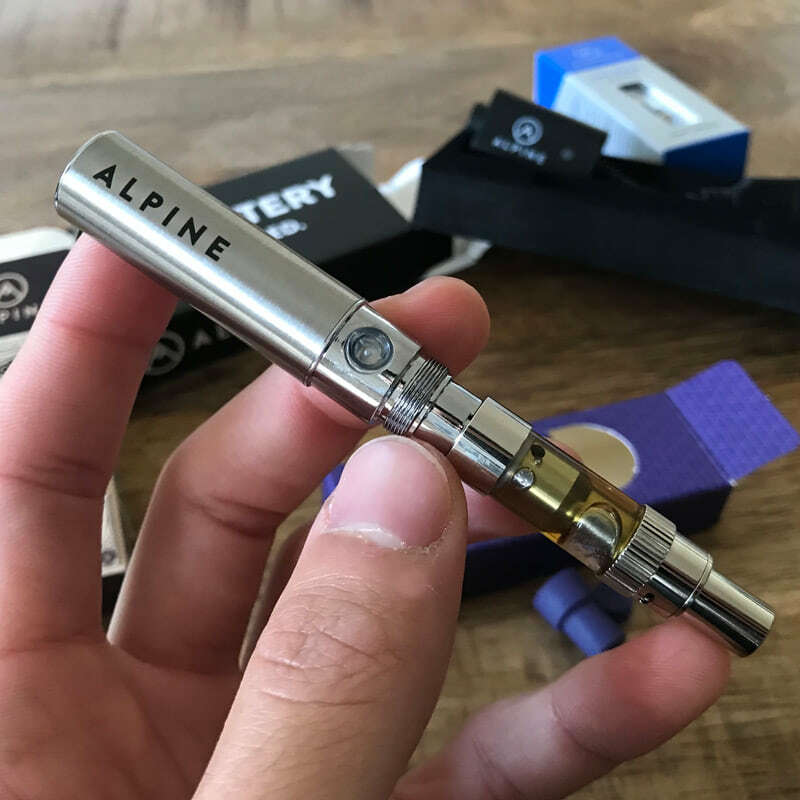 Alpine concentrates are highly potent, crystal clear distillate cannabis oils, rich in real plant terpenes. All of their distillate and Live Resin oils are available in a variety of Indica, Sativa, and Hybrid strains. 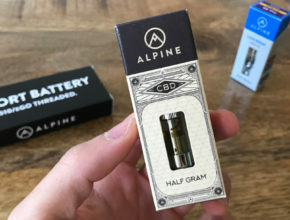 Recently, Alpine launched a new line of high CBD oils including the wildly popular high CBD strains Cannatonic and Harlequin. 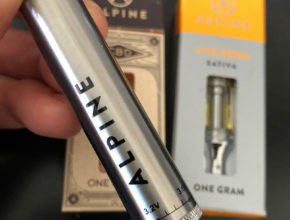 For this review, we tested Alpine’s Live Resin and CBD vape cartridges. 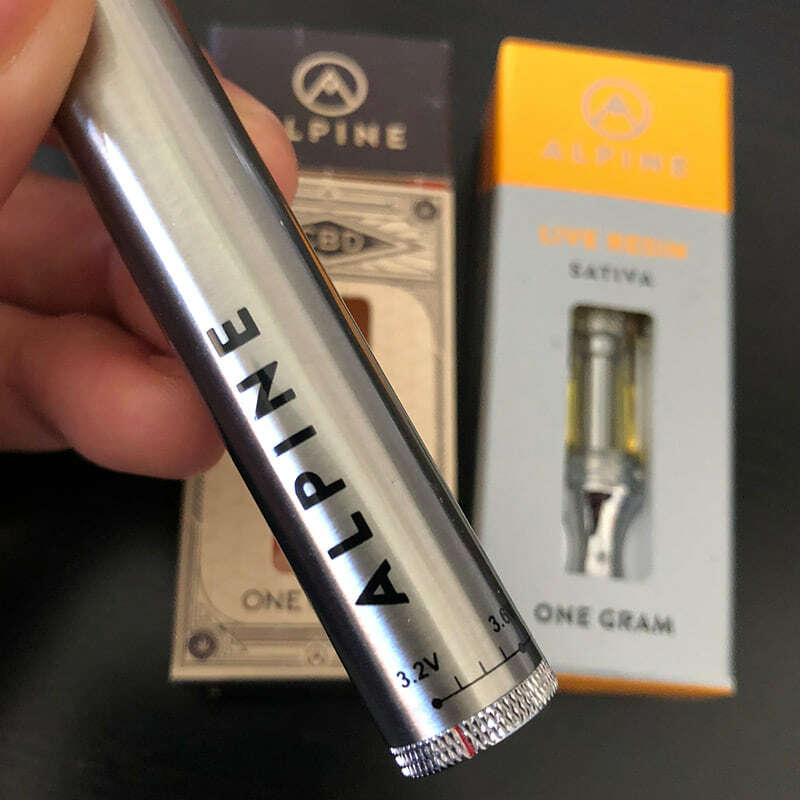 Overall, we were impressed with the design, quality, and effects of Alpine’s concentrates and really enjoyed the experience. 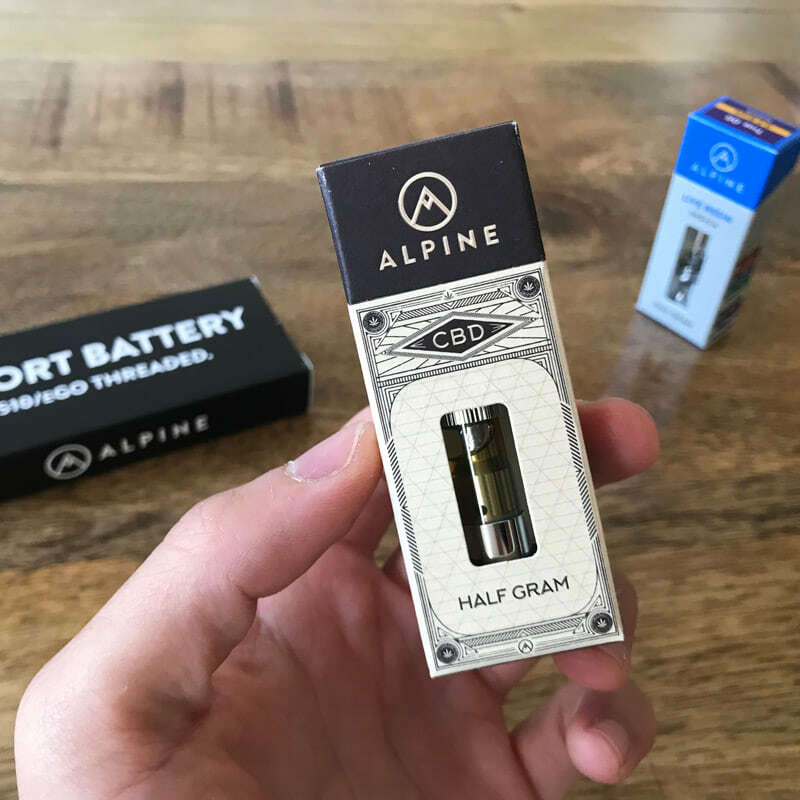 We love the aesthetic of Alpine’s packaging as well as the hardware used for their cartridges. 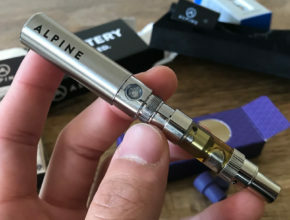 Alpine vape cartridges use the standard 510 threading which is compatible with most vape batteries. 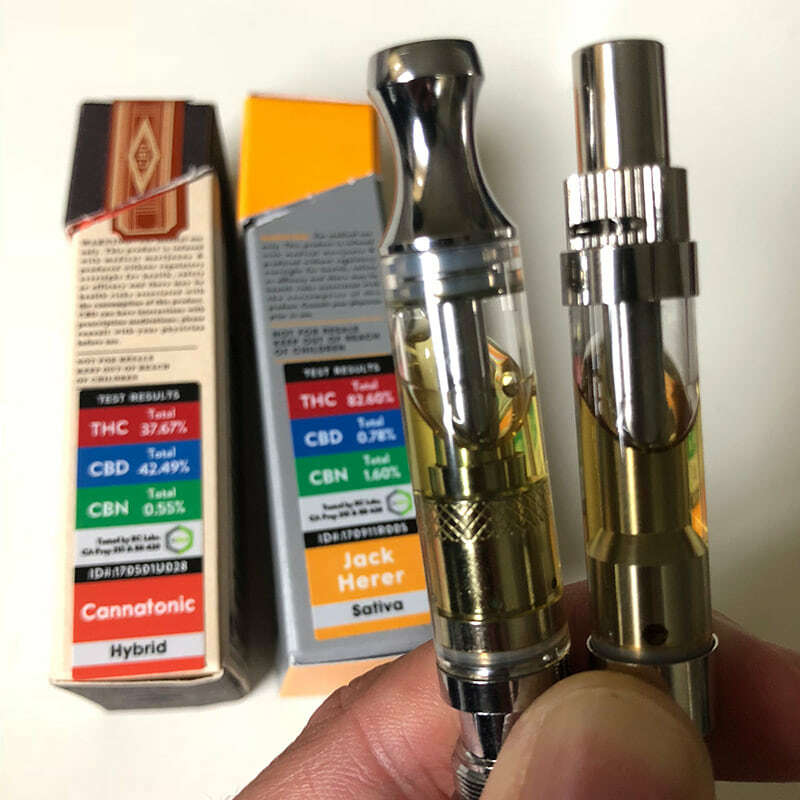 The CBD line and Live Resin distillate oils use different cartridge hardware. 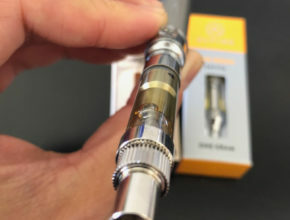 The CBD cartridges have a narrow mouthpiece fitted with a unique airflow adjustment control (you don’t see this on too many vape cartridges in Cali). 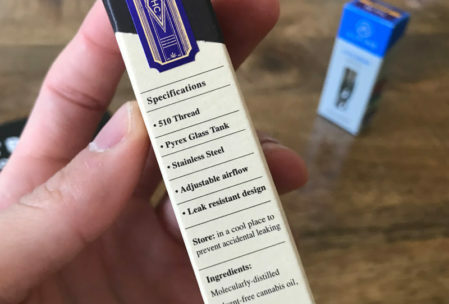 The Live Resin vape cartridges have a wide mouthpiece that’s flared out at the tip. Alpine offers two branded battery options that are your standard 510-threaded battery (eGo threading). Both batteries use a simple, single-button operation. 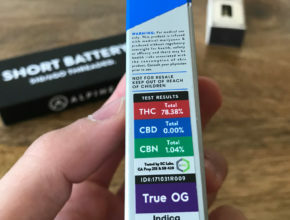 The ability to control your voltage settings coupled with airflow control (on the CBD cartridges) is a nice touch. 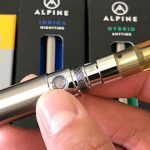 Alpine Vapors delivers a highly customizable experience that’s offered by few cannabis vape pen brands. 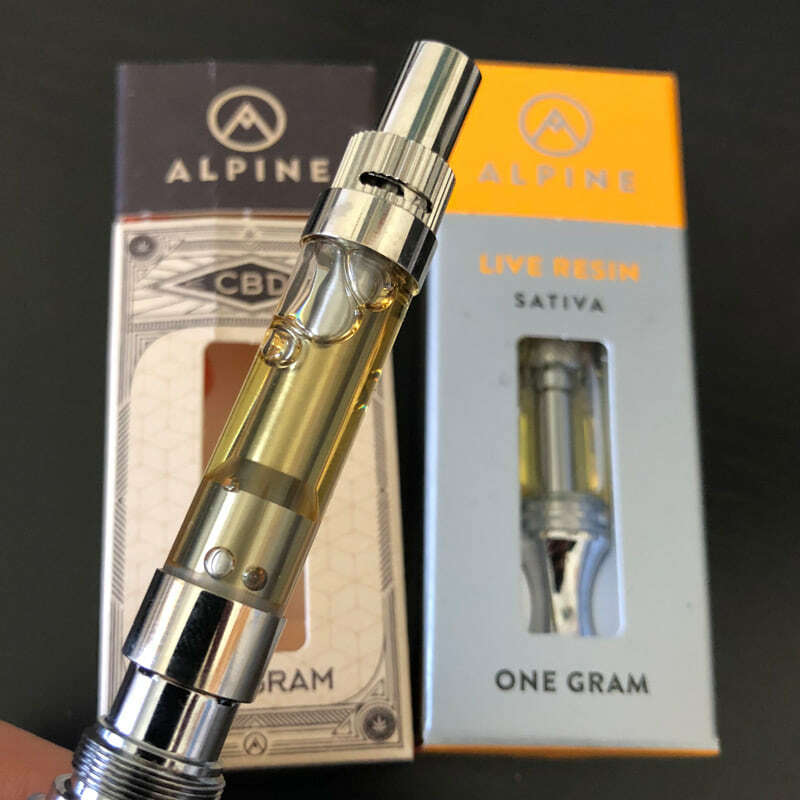 Both Alpine CBD and Live Resin oils have a transparent quality, with only slight coloration. When warmed up, the viscous oils move around like the lava in a lava lamp. The Live Resin oil had a citrus/piney aroma. It reminded us of a light Pine-Sol and Lemon Pledge-like taste. The hits were a bit rough at first but smoothed out with each subsequent hit. These oils leave a similar sensation in the mouth as biting into a fresh grapefruit, but without the actual rawness against the tongue. The CBD oil didn’t have much flavor outside of a typical cannabis flavor profile. It was herby and lush. Inhaling the vapor created a similar sensation to taking a bite out of freshly washed leafy herbs, like cilantro, except the cilantro is cannabis. 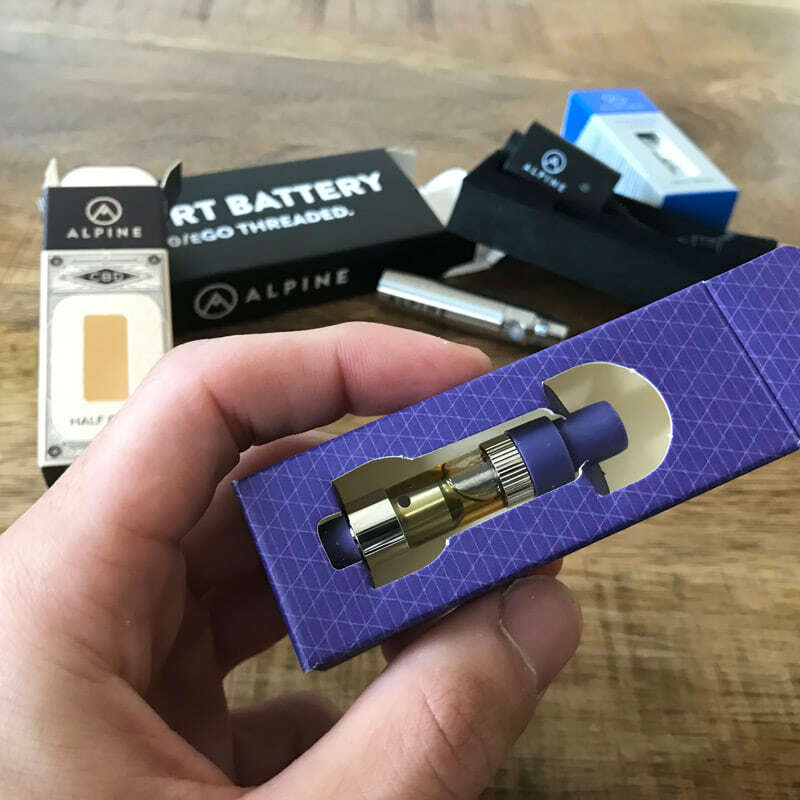 The hits from Alpine cartridges are fairly smooth. It takes a few moments for the oil to warm up and they require a a bit more inhalation to draw a noticeable quantity. But once the oil is warmed, hits are easy to draw and the vapor is smooth. 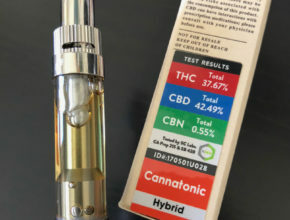 We loved the effects of the Harlequin (hybrid) CBD oil. We immediately felt the effects after taking just three 3-second hits. We noticed the onset of a nice high kicking-in when we started to say all of our silly thoughts out loud. The effects of this lasted for about an hour to an hour-and-a-half. 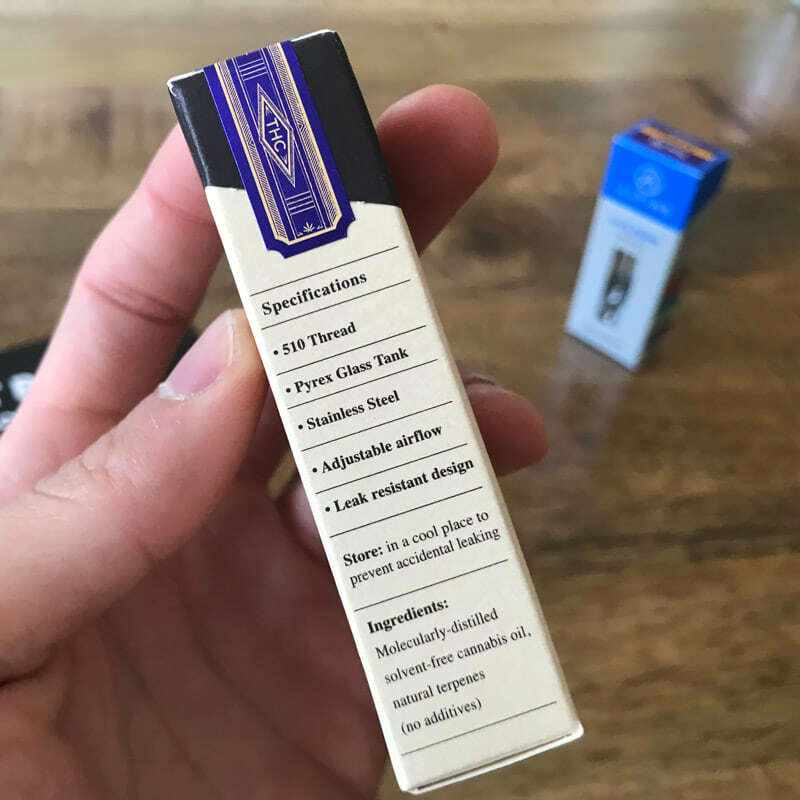 Since this product is aimed at anxiety, and pain relief, we thought a great way to test its efficacy was by going to the gym – i.e. a social setting and getting some muscle movement going. The most noticeable effect was the release in body tension. When working out, we tend to hold stress in the hips and hamstrings, but after using this product, the tension was released. While at the gym, we used this moment of relief as an opportunity to give the legs a good stretch – best feeling ever! Bottom line: High CBD oils tend to be a bit pricier than their low-CBD counterparts. 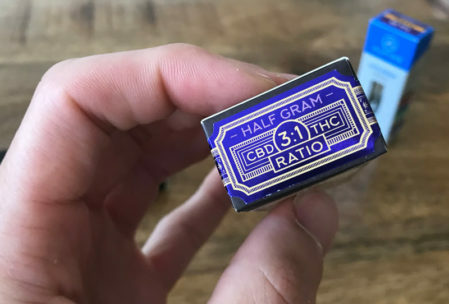 However, the balanced 3:1 CBD to THC ratio oil is well worth it. We experienced phenomenal muscle tension relief, minor psychoactive effects, and a general sense of calmness after using this product – i.e. coherence and comfort. If it’s in your budget, we recommend it for daily use. If it isn’t, then we recommend it as a way to treat yo’ self after an unusually stressful day. 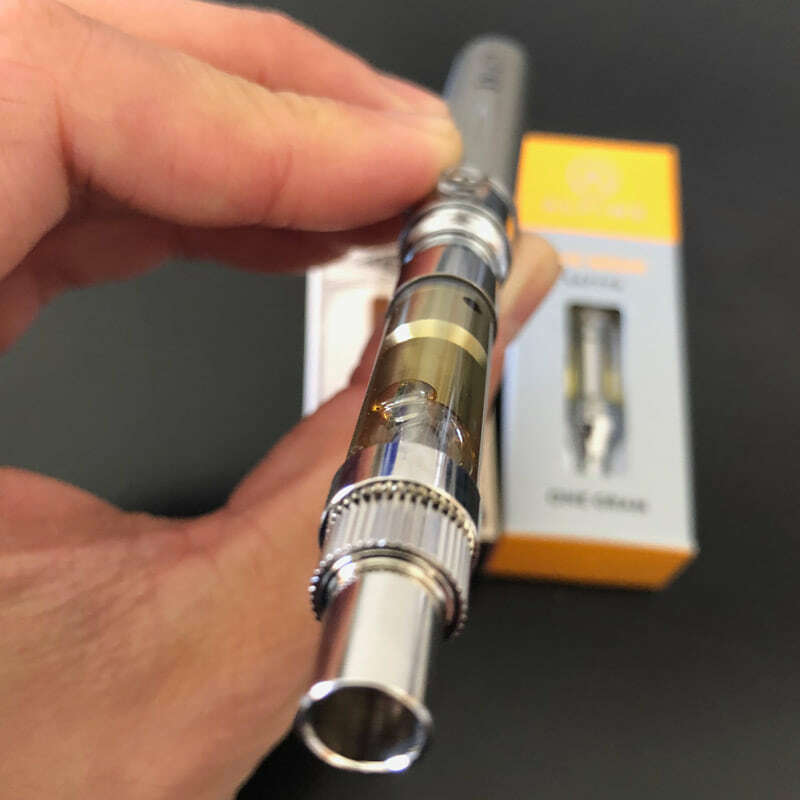 The Live Resin True OG (indica) vape oil gave us an intense, heady sensation. The most potent effect felt with this product was its effect on mental state. The True OG oil induced a bit of grogginess but not to a paralyzing degree. It induced the type of high that leads to some over-thinking – it’s the one that makes us have to get up and get moving; otherwise, there’s a tendency to spiral into a mental pit of despair. This one caused some racing thoughts and a bit of anxiety which were challenging to sleep off. The draw from the first hit was a bit rough, but the subsequent hits were smoother. This product seemed quite potent. The flavor wasn’t overwhelming, rather it was subtle with mild cannabis flavors during the inhale. 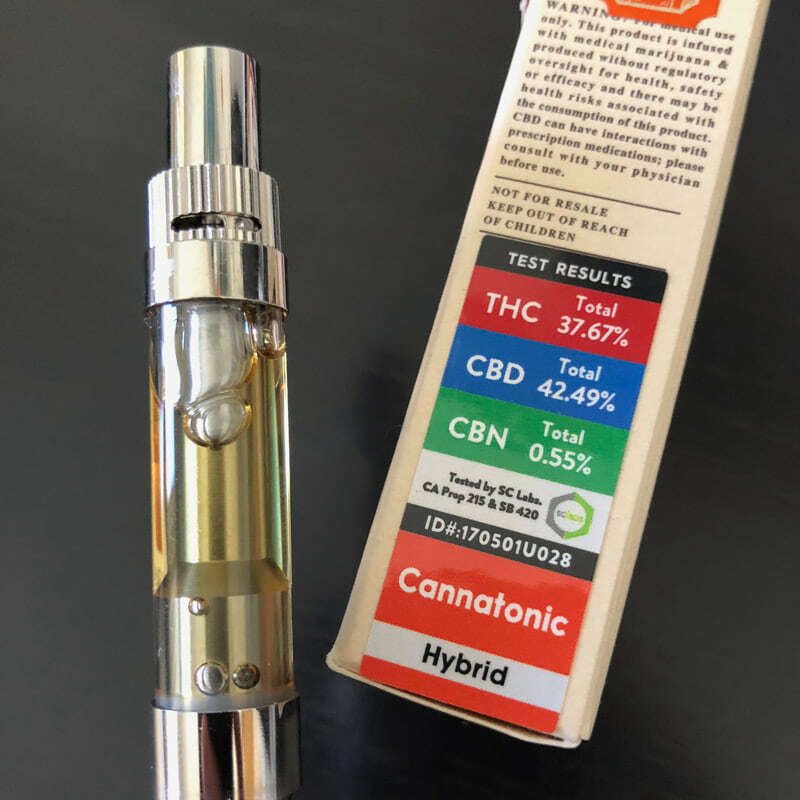 Bottomline: Rated at 75.38% THC, this cannabis oil packs quite a punch. We recommend this oil if you like the strong heady highs that get you thinking. 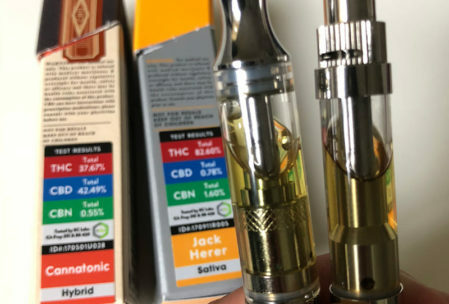 Proceed with caution if you have a low THC tolerance or if it’s your first time vaping cannabis. The effects may be overwhelming. You can enjoy this oil on a relaxed day with some down time. 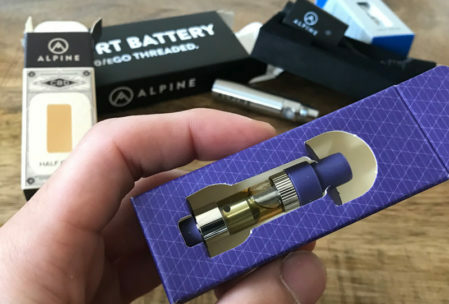 All Alpine Vapor cartridges use 510/eGO threading (works with most vape batteries). 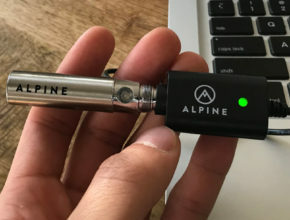 After unpacking the product, and removing any silicone covers, twist the threaded side of the cartridge into the Alpine vape battery. Do not over tighten as this may put unnecessary pressure on the cartridge, which can lead to product failure. Once the cartridge is twisted in securely, press down on the button and inhale simultaneously. Alpine Vapor batteries feature a clear button that illuminates with a white light when powered and pressed. If this light fails to illuminate the battery may need a charge. Easily recharge the battery using the included USB-charger. 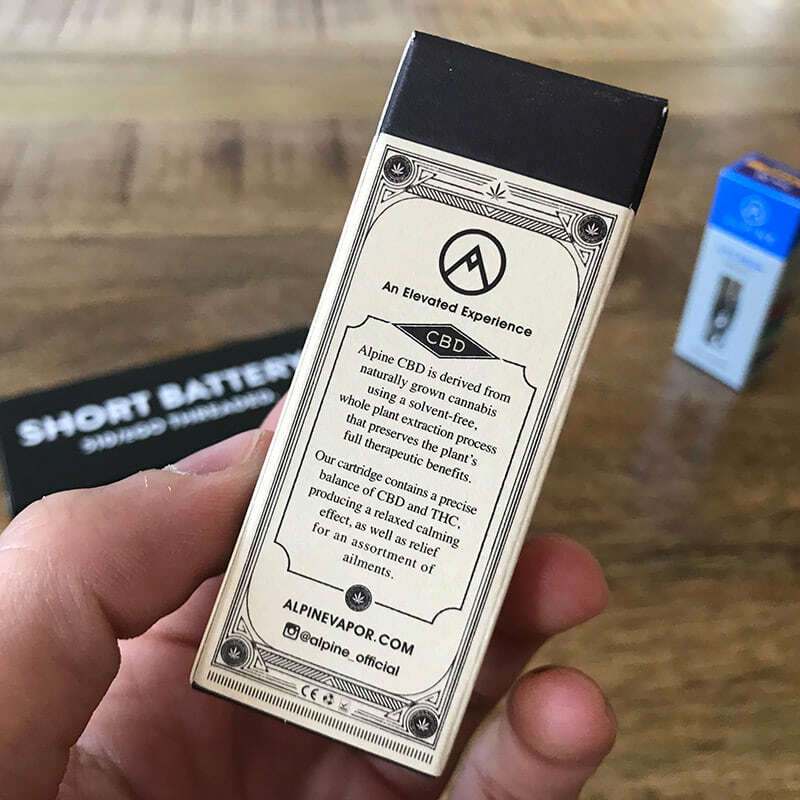 If using the variable voltage battery, simply twist the dial at the bottom of the battery to the desired voltage (around 3.7 usually does the trick). 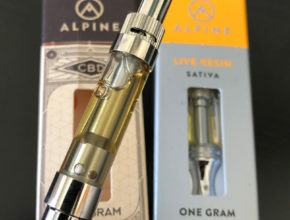 Alpine Vapor Live Resin vape cartridges retail for around $35 for the half gram cartridges and $50 for the full gram vape cartridges. 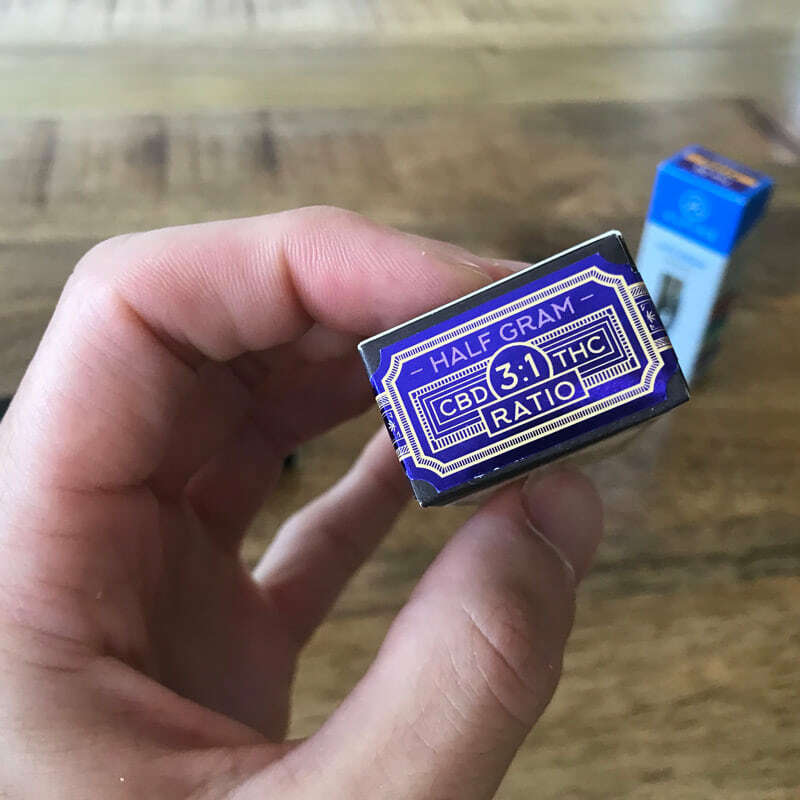 CBD oils are typically more expensive at around $60-65 for a full gram. The branded Alpine batteries run $20-35. 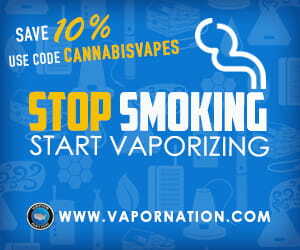 Alpine vapors is available through several dispensaries and delivery services in the LA/OC area. Check here for a list of retail locations. 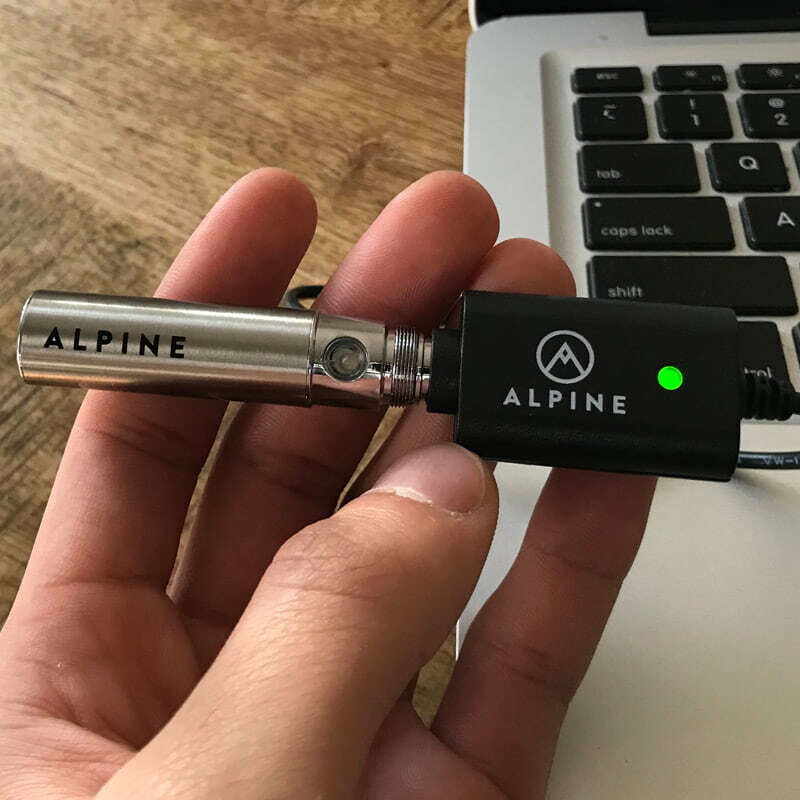 “Alpine Vapor’s mission is to produce the purest, safest, and most discreet cannabis products on the market. They pair cutting-edge distillation technology with beautiful and accessible design to serve the full spectrum of cannabis enthusiasts, from first-time patients to experienced connoisseurs. They want to raise the bar for cannabis-infused goods and proved the world with An Elevated Experience. Alpine Vapor exclusively uses organic, sun-grown cannabis from Humboldt County. The plants are regularly tested to ensure they’re free from pesticides, microbial, and other harmful contaminants. Cannabinoids and terpenes are extracted through a supercritical CO2 fluid extraction system. This extraction method is used to produce decaffeinated coffee and aromatherapy oils, and it is one of the cleanest and safest methods for extracting cannabis. In order to achieve their potency and consistency they refine their oils using a molecular distillation process. This additional step is what serves as the foundation for their collection of premium cannabis products. 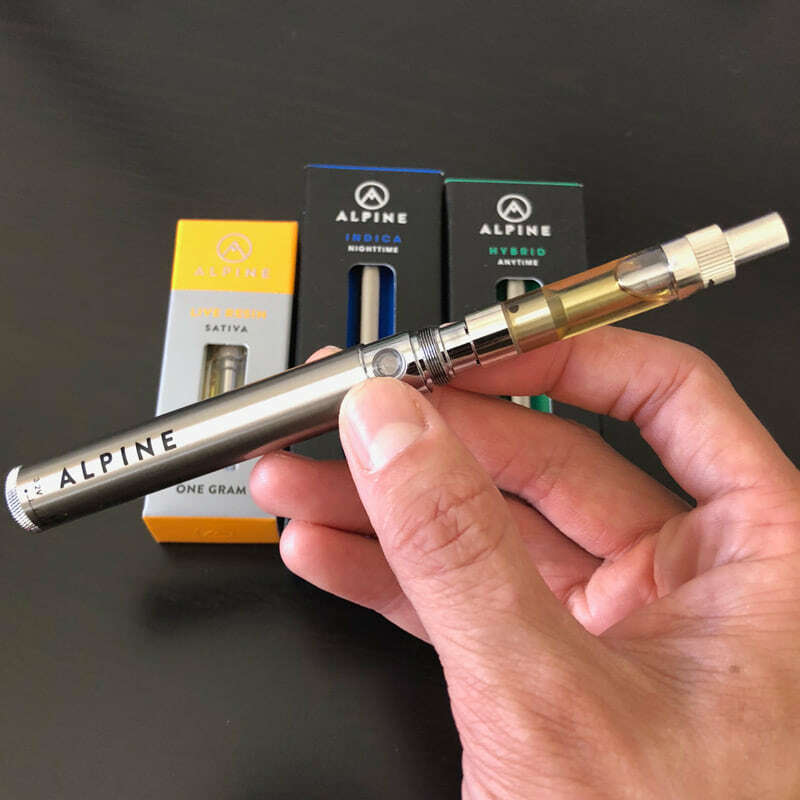 Alpine Vapor has additional products including pre-filled disposable vape pens and concentrate distillate (oil) syringes refills. Stay tuned for more Alpine Vapor product reviews coming out soon!